Beautiful card Sylvie, I love the flower and the butterflies. This is a gorgeous card. I love the fabulous layout and the beautiful colours. Stunning card, love the choice of colours. Aw he would be chuffed to see his name lol He and his fiancee get married next Saturday too 22nd! WE we off on the Mary but not stopping at Gib. I actually sid, typical we not stopping there this time as I have a buddy there. Oh what a gorgeous card. 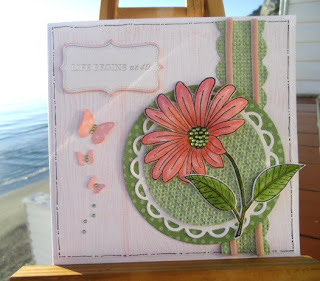 A beautiful flower and gorgeous texture on this card.